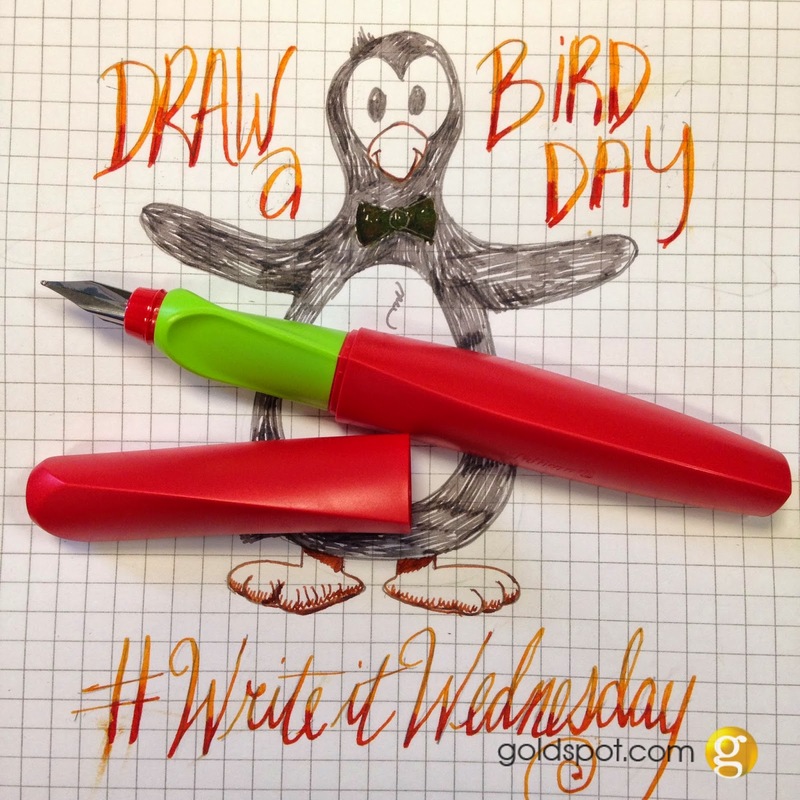 In honor of National Draw a Picture of a Bird Day, our #writeitwednesday challenge for April 8th, 2015 is to draw a picture of a bird using a pen and taking a photo of it with the pen you used to write with it. It can be a cartoonish bird, a photo-realistic bird, or a poorly drawn bird, etc. It can be any bird species you prefer. Just don't flip the bird, if you know what I mean. The spirit of this day is to make someone's life a little brighter with a fun bird drawing. Share the pic of your entry on Instagram or Twitter with the hashtag #writeitwednesday and mention @goldspotpens to make sure we see it! You may also opt to e-mail us the picture at social@goldspot.com. Deadline for entries will be Thursday at 10:00am Eastern US Time. We will randomly select a winner on Thursday at 12 Noon. Up for grabs this week is a Pelikan Twist Fountain Pen. A fantastic, fun and colorful starter pen, this pen has a twisting, faceted body, cap an grip section. The pen nib is a reliable stainless steel point and fills using ink cartridge or converter. Each Wednesday, we run a new social giveaway challenge with a different giveaway prize every week. Anyone around the world with an Instagram, Twitter, Facebook or E-mail account can enter. Once the entries have been collected and the deadline has passed, we randomly select one of the entries as the winner of the giveaway and send the prize accordingly. No purchase is necessary to enter the #writeitwednesday giveaway. Those who enter the contest via social media may have their images shared by Goldspot on this blog or on Goldspot's Social media accounts. The winner will have 1 week to contact us by e-mail to claim their prize. If the prize is unclaimed, it will be used in a future giveaway.